One of the interesting things presented at last week’s JumpStart event, was the rise in mobile penetration in Zimbabwe between 2006 and 2011. The actual significant rise started in 2009, but 2006 shows just how low it was just a little over 5 years ago, 848,000 subscribers. 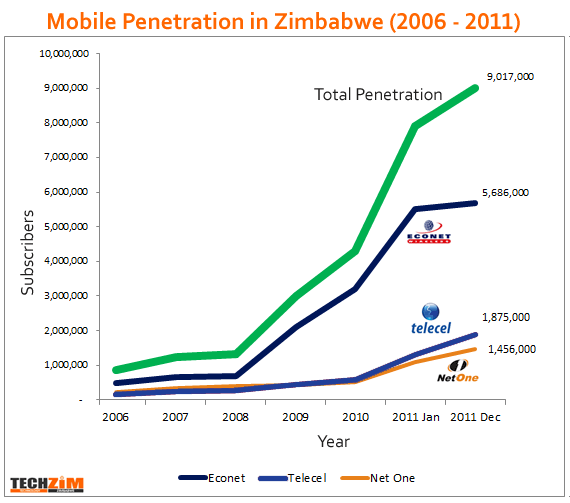 Now Mobile penetration is 72% and the largest mobile telecoms firm in Zimbabwe, Econet, has some 5,7 million subscribers. We thought we would share the image below that shows clearly just how much progress has been made getting mobile to more people in the country. Granted, the 9 million is just active SIM cards and not the actual number of people that have mobile phones. That’s a discussion for a different time.